Burnt Mountain (9353') is Roach #37. We first did this mountain 3 1/2 years ago. What I remembered most about this one is all the rocks standing up around the summit area. It seemed like a mountain just right for this time of year, and we were ready to pay it another visit. Our plan was to start at Lefthand Canyon Road and do the point list in the reverse order listed below, as shown on this map. We started hiking at 10:25, from a fisherman's parking area at an elevation of about 8000 feet, next to Lefthand Creek just off Lefthand Canyon Road, crossing the road and heading 100 yards east, to where a 4WD road begins. Following the 4WD road north, up the steep slope, we climbed to the top of the ridge. Near the top of the ridge, we left the 4WD road, and turned right, heading north, through the forest, and down the other side of the ridge. Descending the ridge down to Spring Gulch Creek, at its confluence with another creek from the north, our plan as shown on the map was to head east/northeast to an east knob of Burnt Mountain, and then continue on to the summit. Because we wanted to make a bigger hike out of it, we instead headed in a more northern direction until we hit Gold Lake Road, then walked west along the road to about the 9000 foot level, at the saddle between Burnt Mountain and Quartz Mountain. At that point we left the road, with the odometer showing 3.36 miles, at 11:57, heading southeast. There is some private property in this area which we had to walk around. Apparently Quartz Mountain was rightly named, since we did encounter lots of quartz. Not surprisingly ascending the north side of Burnt Mountain at this time of year, we soon encountered lots of snow. But the snow was mercifully firm enough to walk on top of, most of the way. We reached the summit of Burnt Mountain at 12:19, where the odometer showed 3.86 miles. 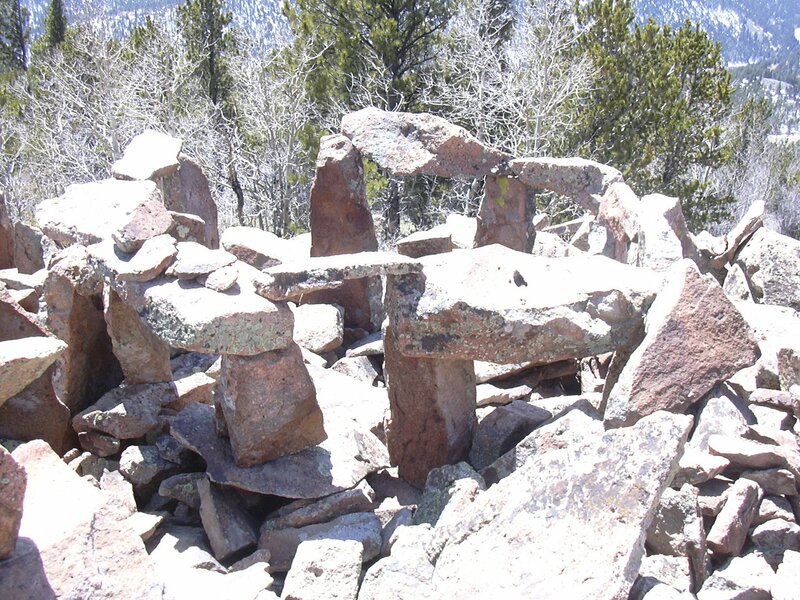 The collection of balanced upright stones near the summit was even larger than last time we were there. Someone had created a tiny Stonehenge, and a stone man. We had lunch amid the balanced stones on the south side of the summit. Leaving the summit at 13:05, we headed down the way we had originally planned to go up. 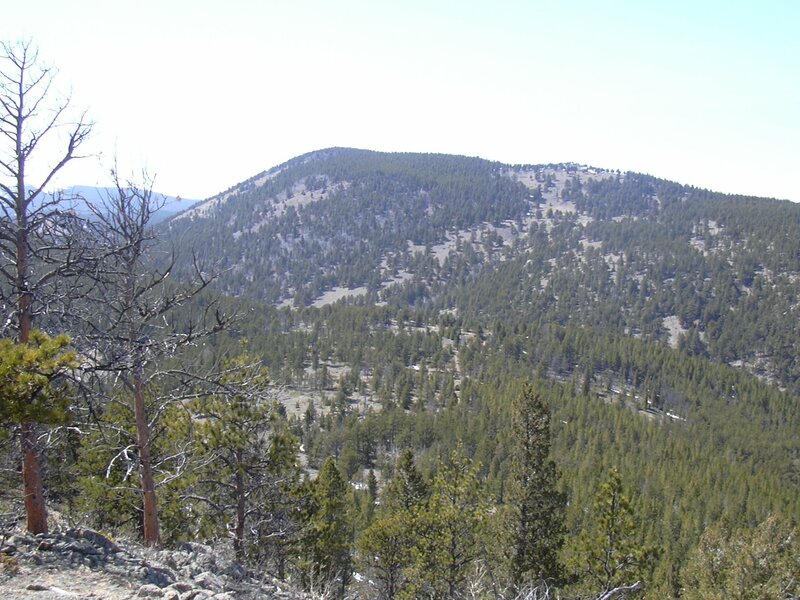 The east knob of Burnt Mountain is right on the boundary of national forest and private land. There is a house very close to this knob. From there we headed down the east ridge, which is interspersed with meadow and forest. Back down at Spring Creek, we headed back up the ridge, the way we came, then explored a knob just to the east of our incoming track, before heading back. We returned to the parking area at 15:25, where the odometer showed 7.66 miles. The total trip time was 5 hours, and the total elevation gain was about 2100 feet.